I know brussel sprouts have a bad rap in the world, and everyone is plain wrong about these little guys. Seriously! They are wonderful, tasty little cabbages that need a little love and can make a meal wonderful and healthy. Yes, even when you grate Parm cheese on them. It’s a healthy fat hard cheese anyhow, so don’t feel bad about it. I made this simple dish simple to make. I tend to do that, I like the veggie to shine in all of its glory. I am a veggie lover after all, always have been , so when someone put these little guys in front of me about 6 years ago after a lifetime of not eating them, I was sold. You can also grill them with this recipe just as easlily. The first time I made them I pan fried them, the next grilled, but this time I roasted. It’s back to normal temps in my area so ovens are permitted. But for those of you who are in the hotter regions, I would totally grill, then plate, then grate. 1. 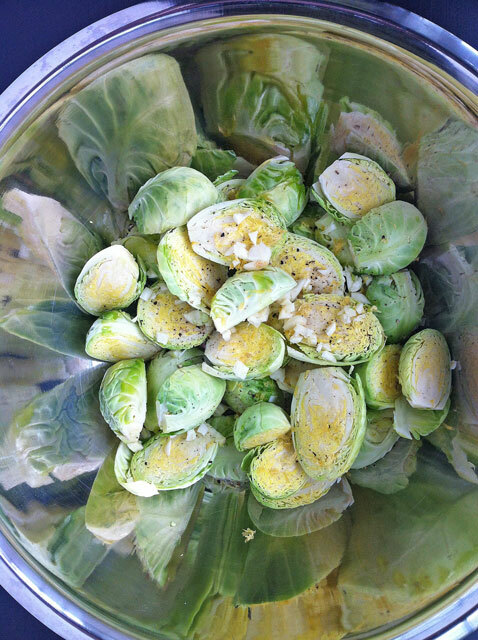 Place the cut brussel sprouts, minced garlic, lemon juice, olive oil, salt and pepper in a large bowl and toss until all brussels are coated evenly. 2. On a sheet pan lined with parchment paper or a silpat, place the brussel sprouts cut side down, place in the oven, and cook for 30 minutes. 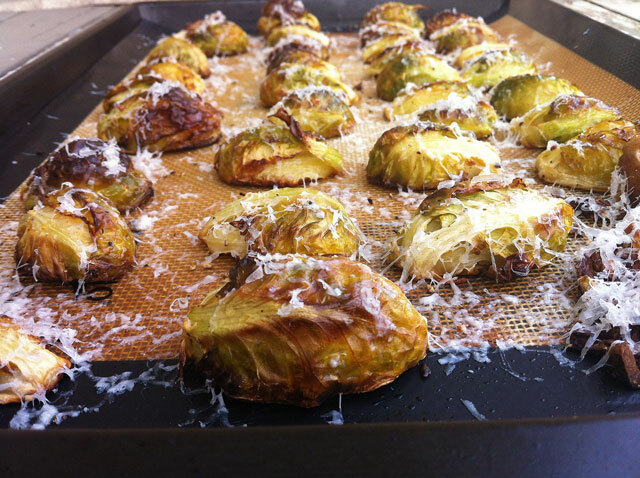 Remove from oven and sprinkle the lemon zest and Parmigiano Reggiano on the brussel sprouts. 3. If grilling follow step 1, then place the brussel sprouts cut side down, and grill for 15-20 minutes. Remove from grill and sprinkle with lemon zest and Parigiano Reggiano. Oh my–I love brussel sprouts. I love the flavor combo. Can’t wait to give this recipe a try! Thanks for stopping by my blog! You will totally love this for the brussels. mmm these look so good. Roasted B Sprouts are the best! Must make these. Also, thanks for your twitter follow. I love your blog! Thank you for the comment, twitter follow, AND the kind words. I appreciate it very much! I just subscribed to you rss, so I can follow your blog, and I am looking forward to it! I love this…I want to try to make these for my husband. He loves brussel sprouts! If he love them, he will love these! And thank you:). Roasting brussel sprouts is my favorite way to enjoy them, love the flavors you added! Looks awesome! What a great way to get your greens.